It’s here, the big reveal day! 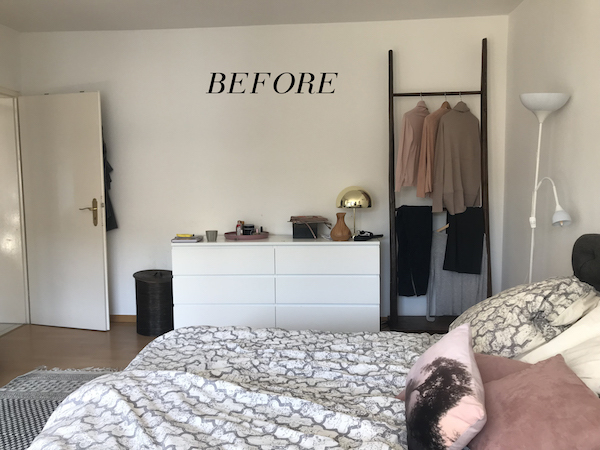 Along with more than two hundred other guest participants, I am revealing my Fall 2018 One Room Challenge space: my master bedroom. I’m sure I’m not alone in breathing a huge sigh of relief. 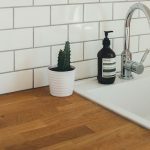 This project was done in real time, completed over the last five weeks and, as my first time participating in the One Room Challenge, it’s been quite a ride. I’m so happy that the room is complete and I’m so excited to show it to you. 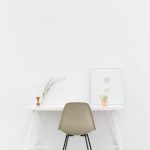 I wanted to do a little introduction before getting down to it, as I suspect many of you are brand-new to me and this blog – thanks so much for visiting! 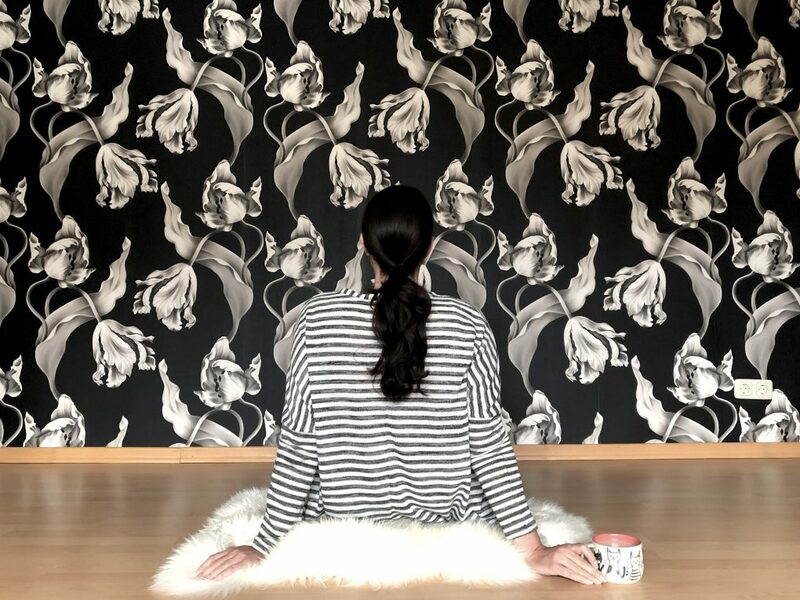 I’m Nicole and I am a Frankfurt-area interior designer and blogger who believes that design should nurture your life. I am American but have been living in Germany for more than 15 years. 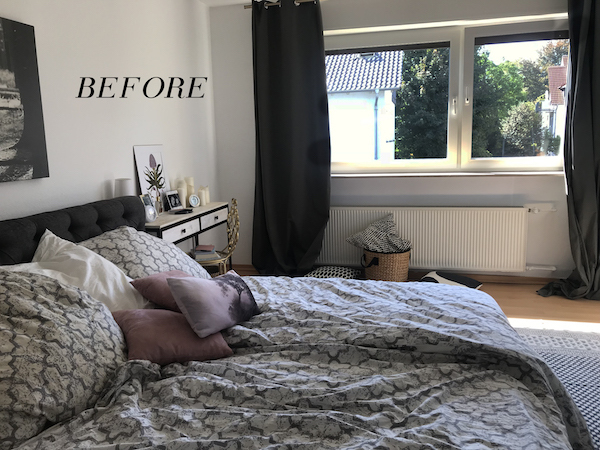 This is my very first ORC and I decided to join in the fun this season because I was really aching to give my own bedroom a makeover and I knew this would be the motivation to really dive in and complete the room in a short amount of time. Boring. White walls, mismatched nightstands, and you can probably guess which is my side of the bed and which is my husband’s. 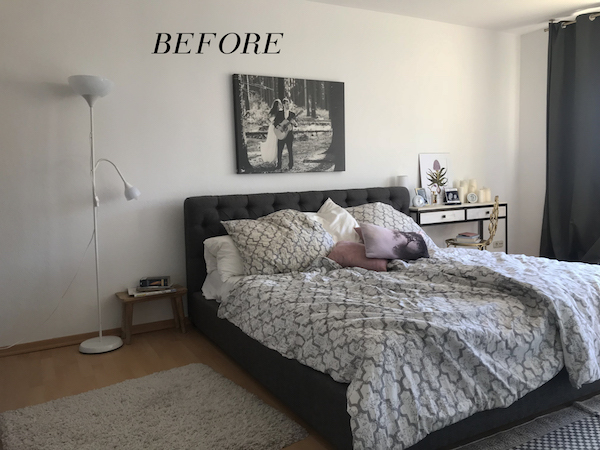 We were happy with our bed and the wedding photo above, but a lot needed to change to make this space a comforting and relaxing sanctuary that a master bedroom should be. 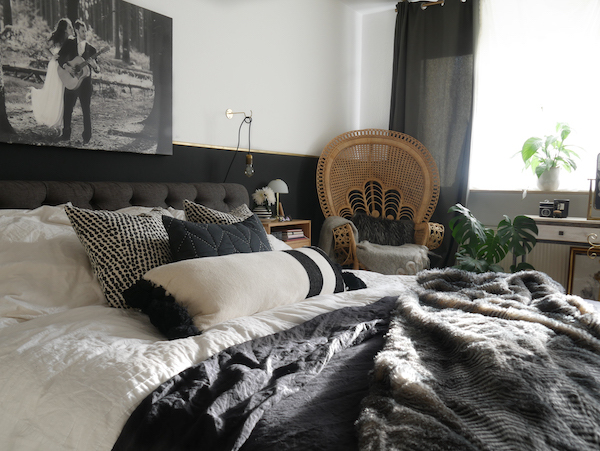 The major change I wanted to make was to incorporate a dark and dramatic moodiness to the room. Black paint and bold wallpaper were on the top of my to-do list. Here is the new view as you walk into the room. 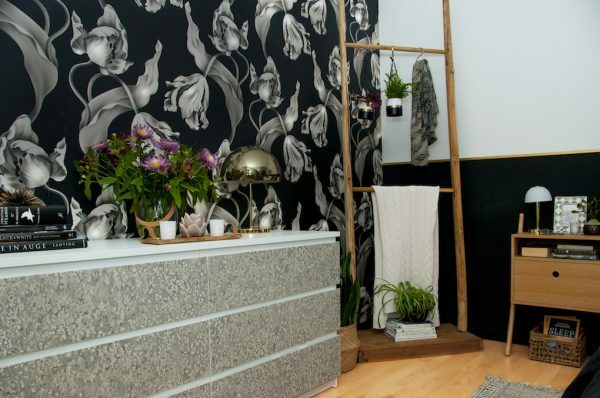 I painted half the wall in deepest black and added a sleek, thin dado rail in gold to break up the monochrome. 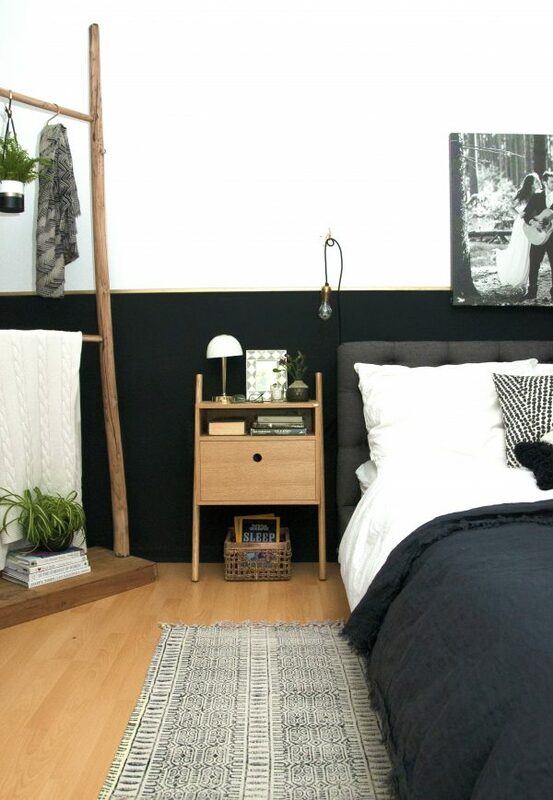 The bold black and white contrast is warmed up by plenty of wood and natural elements. It’s much darker than before, but the room gets so much light from the big window that it feels cozy and intimate. 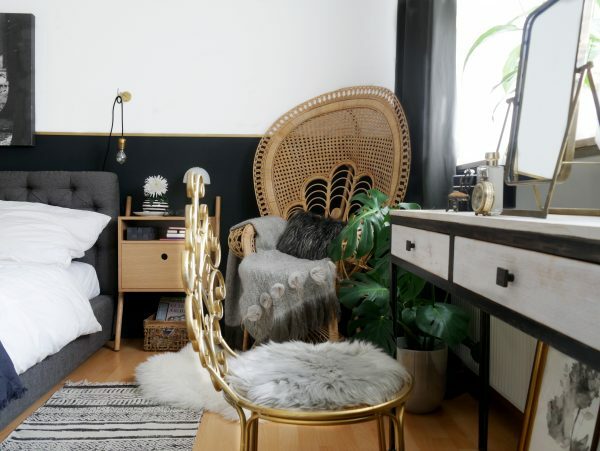 Gold accents and plenty of greenery make the space even more alive. 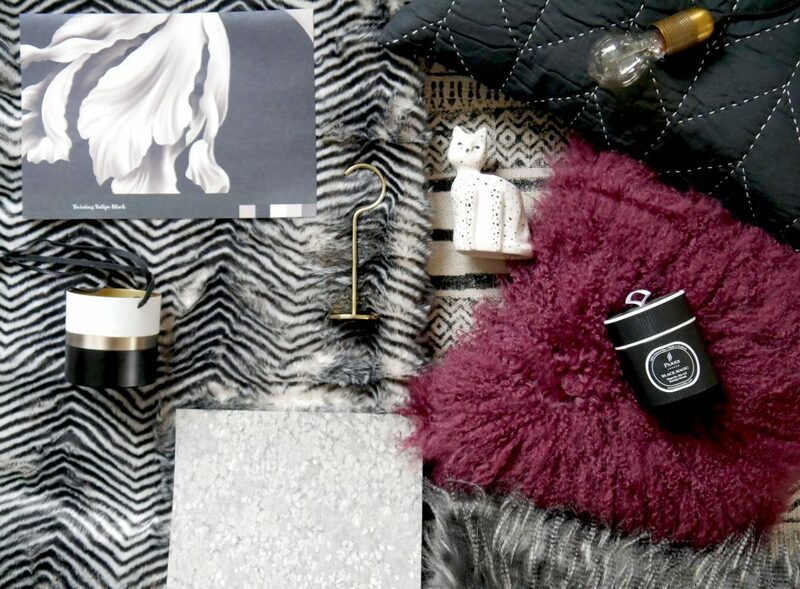 And true to my personal style, layers and layers of neutrals and an abundance of pattern keep interest up even within a strict monochrome color palette. 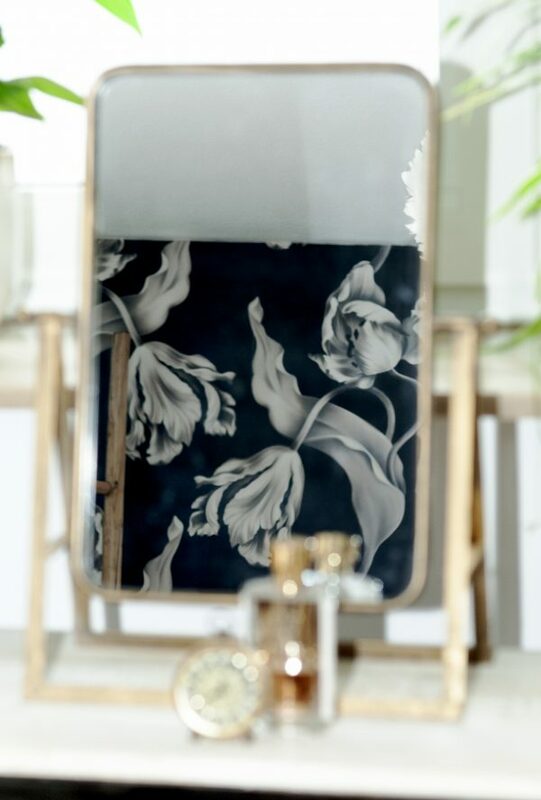 The Ellie Cashman Twisting Tulips wallpaper was added to the adjacent wall and is the showstopper in the room. 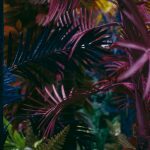 I fell in love with Ellie Cashman’s sublime wallpapers the very first time I saw them and have been dreaming of using one in my own home for years. I am so very pleased to be able to wake up to this glorious botanical view. 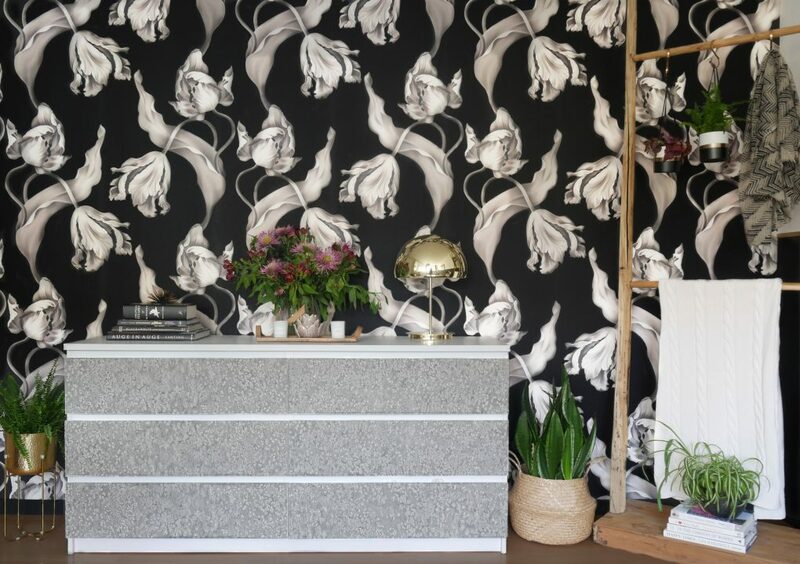 The long white IKEA Malm chest of drawers was also begging to be dressed up, begging for a layer of luxury. 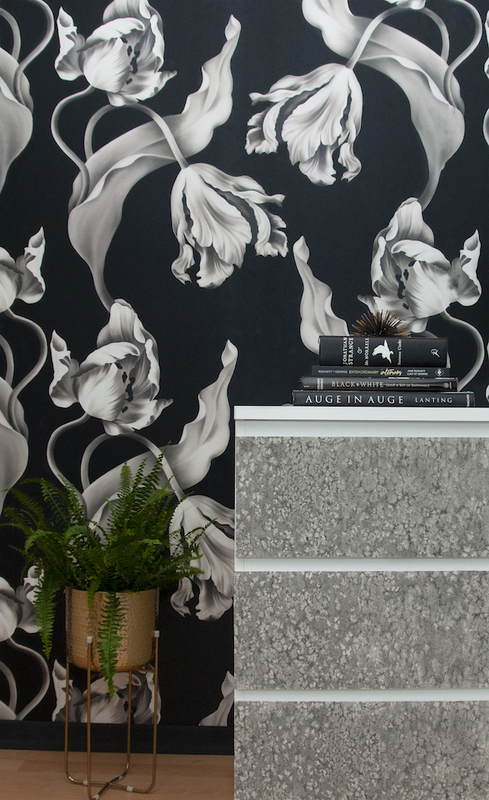 So I did the ultimate high-low mix with an easy wallpaper hack using Zoffany’s Weathered Stone. 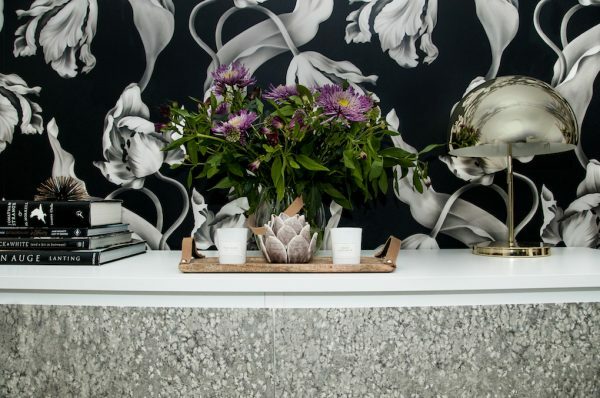 I love how the two wallpapers are so different and yet their shades of grey play off of each other so well. Both organic in nature, yet the sinewy, flowing blooms contrast just perfectly with the grounded earthy texture of the stone. Ying and yang. 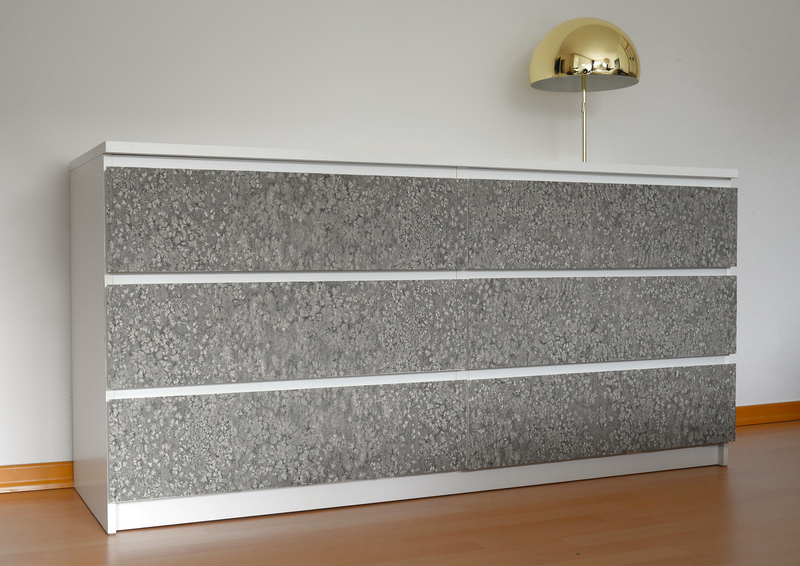 The nightstands from Danish design firm Hübsch are new and I’m very pleased with them. Once we got them fixed to the wall, it has been so nice to have more than enough space for all of the things I like to have near my bed. Matching tables on each side of the bed has certainly added some much needed balance that was missing before. The tall wooden rack from India was a piece I was not sure would stay in the room. It had a dark colonial look to it and just did not fit in with any of the ideas I had for this space. It was purchased years ago for another home at another time. It has ended up in my bedroom because I really don’t have space for it anywhere else in the house. I wanted to make it work because it’s so unique, so we gave it our best shot. My husband sanded it down and I love the rustic, Scandi vibe that emerged. 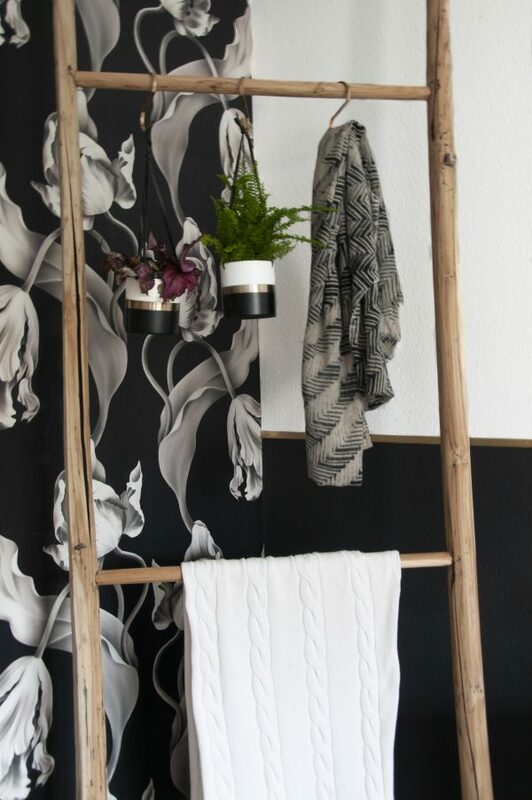 It’s the perfect place to hang blankets and plants. The side of the room by the window is my side. I’ve added a majestic peacock chair for a little reading nook and moved my vanity table under the window. I searched high and low for the right chair for this space. My original idea was something more along the lines of a cocktail chair. I ordered a few chairs to try out and the smaller chairs just got lost in the corner. In the end I realised that I needed to go with something that takes up a lot of space to balance out the objects on the opposite side of the bed wall, yet was delicate enough not to overwhelm. The large rattan peacock chair fit the bill. My kids call it the throne. They have requested that it be moved downstairs to the dining table on birthdays as the place of honour. The one thing that did not go to plan is that the retro table lamps for the nightstands never arrived. I’ve now been promised that they have shipped but I’ll believe it when I see the lamps in the flesh, so to say. These small bedside lamps will do for now. The lightbulb sconces are fun and I’m going to see how they look with the table lamps if/when they are ever delivered. 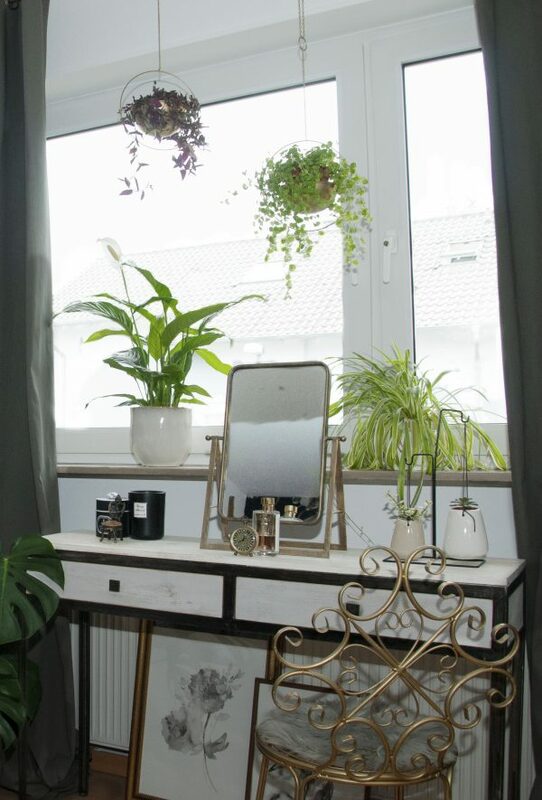 The console that used to act as my nightstand has been moved in front of the window to create a pretty vanity area for me, as well as a beautiful area for my plants. 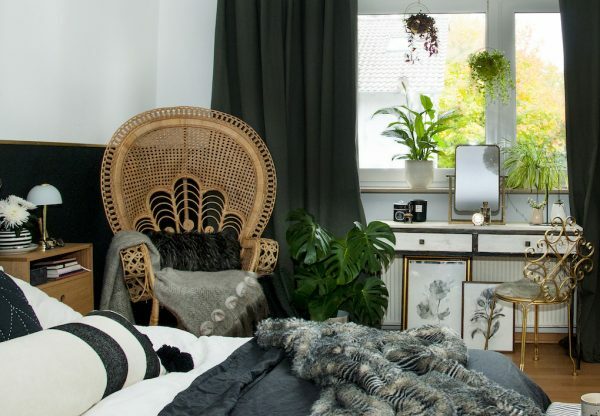 I’ve tried to use a lot of purifying plants that are great for the bedroom, including peace lily, snake and spider plants and ferns. This area is my little oasis. The art leaning against the wall are my own watercolours. After five manic weeks of decorating, I just want to relax and enjoy this space now. 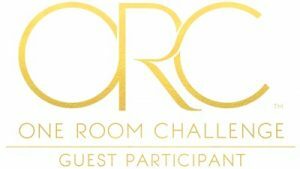 I cannot thank everyone enough for their support on this project and Linda from the One Room Challenge for creating this event and the constant support and cheering! There is such a wonderful community spirit around the ORC! I truly had a blast despite the craziness of the past five weeks! If you have not already, go check out the very talented featured designers. To all of those that participated as guests, happy REVEAL day!!! WE did it!! And to all of you readers, go check out their inspiring reveals right here!! 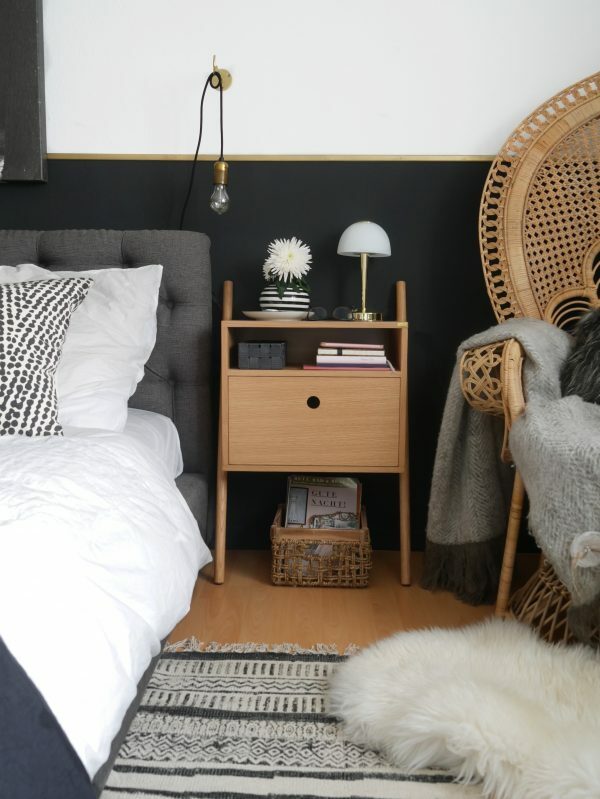 Love the new look of your bedroom! That wallpaper is amazing! Love all the details in this room! Thank you so much!!! I’m so in love with the wallpaper as well! What a fantastic transformation! This is absolutely amazing! Thanks you so much Allison! The room is stunning and what a joy to wake up to every morning, talk about starting your day right! Thank you Jo! I do love waking up here now 🙂 Happy to help with your room! Looks amazing and in such a short time, very inspiring . Thanks so much Mel! It really was a short time, but that deadline kept me so motivated to really finish the room! Brilliant transformation! I love the peacock chair too ☺️ Well done! You knocked it out of the park!!!!! 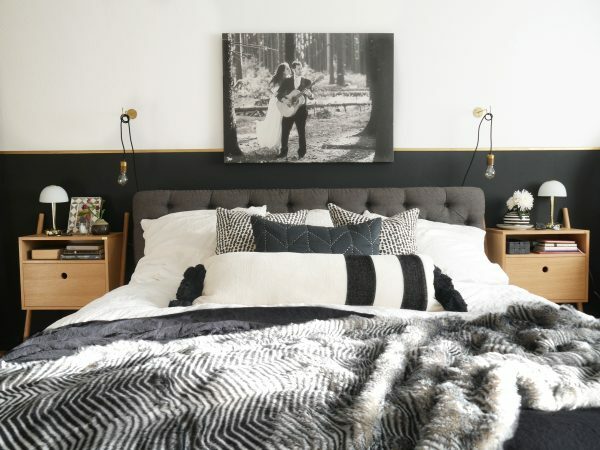 Love everything about this bedroom now. Thanks so much! It’s so encouraging to get a positive response! This is fantastic. I love every part of it. I am very proud of you and not surprised – you are very talented! I hope Magic is better and you (and your wonderful husband for helping you through all this) get a rest! Thank you!!!! Magic is much better and hopefully this weekend we can finally get some rest! Thanks Sarah!! It really wa sa lot of fun to complete this, I hope I can do another room in the spring! Great job! It’s very fun and love the black/white! I think the ladder totally works, too! Thanks so much!!! I’m so glad the wooden ladder worked out. 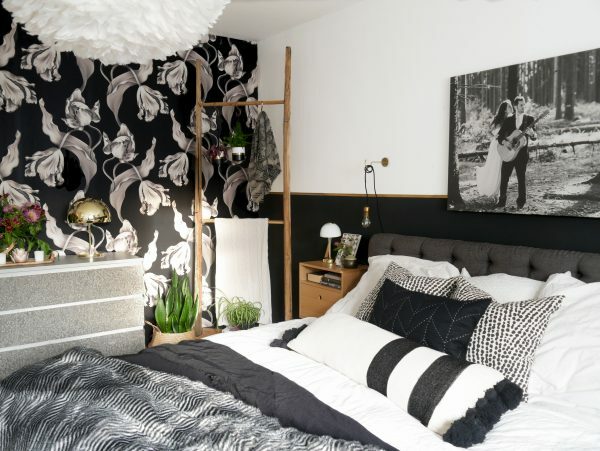 Love everything black & white, and this is some serious bedroom goals! Amazing job! Thank you so much! I just adore black and white. Congratulations Nicole for finishing your project. What an accomplishment, both personally (your home) and professionally (your business). A fantastic job you can now enjoy.